Follow these easy steps to be prepared for your retractable awning installation! Having an awning installed onto your home is a great way to extend your living space, protect your patio from the weather elements, and protect your home from the sun’s harsh UV rays. 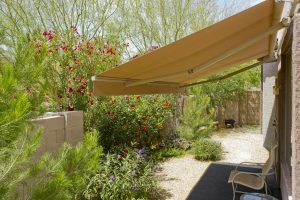 Retractable awnings allow you to easily open and close your awning with the press of a button or a simple crank. Though it is not a major project, it is still beneficial to be prepared. Here is how to prepare for your retractable awning installation. Before the contractors show up to install your awning, be sure that you clear a path for them to easily get around your yard. This helps to prevent any potential injuries while they transport and install your awning. Also make sure the patio or deck itself is completely cleared off. Keep any pets and young children far away from the work area. While the retractable awning is being installed, it is a good idea to double check before they secure it to make sure it is in the right place. Once it is installed, a retractable awning is meant to stay in place for years to come, so it is important that it is installed properly. You want to allow the contractor their space to do their work, but also check in from time to time to ensure that things are being done correctly and the way that you would like. Once your retractable awning is installed, the contractor should show you the correct way to operate it so that there isn’t any confusion. A motorized awning will come with a remote, while a manual one will have a crank for you to use. .This is the time to ask any questions that you may have about your new awning so that you get the longest lifespan possible out of it. Once everything is completed, you may then put all your furniture back onto your deck or patio and enjoy your new retractable awning.